Hopefully, this will be the start of a new section within the TYRP Interactive section of this site. 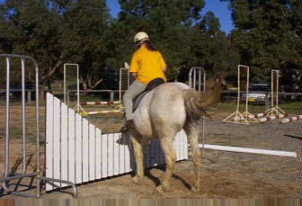 Pictured below is a 'predicament', in this case a pony refusing at a small jump. The idea of this quiz is for you to describe how you would attempt to fix this problem. These quizes will be different to the others - the best answers will be voted upon by us (Leah C, Caitlin and Leah P.) and published on a page on this site. Hopefully (eventually) I will have a series of 'predicaments' with ideas of how to fix them from different young riders all over the world, and possibly these ideas will help riders who have these problems with their horses. Don't worry, more 'normal' quizes will continue to appear regularly! How would you attempt to fix this problem?